One of the most popular and well respected, if not profitable low-cost airlines Norwegian has put its latest tail fin her in to service. Adorning the fin of a Boeing 787 aircraft is the eighth American to be immortalised on a Norwegian plane, civil rights leader, Harvey Milk. Ever since the carriers first aircraft took to the skies, back in 2002, Norwegian has always honoured iconic figures on the tails of its aircraft, celebrating personalities who symbolise the spirit of Norwegian by pushing boundaries, challenging the norm and inspiring others. Harvey Milk, among the best-known civil rights leaders in modern history, fearlessly pursued the freedom for every human being to live life with authenticity and courage. As one of the world’s first openly gay officials, Milk’s ground-breaking election in 1977 to the San Francisco Board of Supervisors, offered hope for all marginalised people across the globe. Today, Harvey’s legacy lives on through award-winning films and documentaries, plays and operas, books, and scholarly contributions. His name graces schools, community centres, parks, and streets around the world, proving that his pursuit of acceptance and equality is remembered, honoured, and continues to this day. 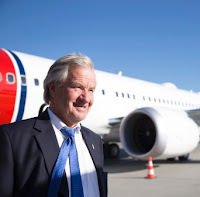 Bjorn Kjos, Chief Executive Officer at Norwegian said: “Norwegian was founded on the premise of bringing affordable fares for all. Our message of inclusion goes beyond just that of affordable fares, it is unifying customers, colleagues, and business partners from all over the world who share our vision of diversity. Like ours, Harvey Milk’s mission was reflective of a pioneering spirit. He demonstrated a tireless hunger to look past the differences of people and instead focus on bringing them together for the greater good. We can’t think of a better way to honour Harvey Milk’s bravery and courage than to dedicate a Boeing 787 Dreamliner to his legacy of equal rights – a tribute that will span the globe for years to come, reinforcing our joint commitment to making the world a smaller, friendlier and more inclusive place”. 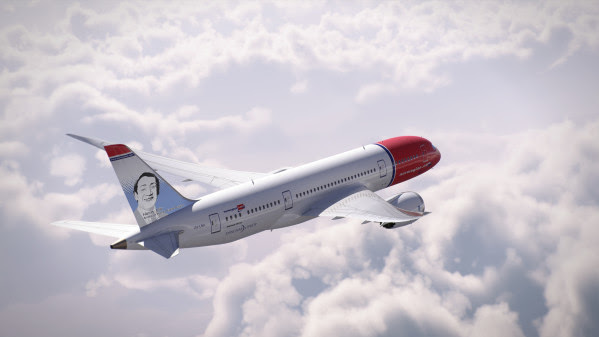 Stuart Milk, nephew and co-founder of the Harvey Milk Foundation said: "We are proud to partner with Norwegian, having Uncle Harvey join the airline's forward-thinking Tail Fin Hero program that already includes change-makers like Sojourner Truth and Oscar Wilde. This is such a unique way to educate and celebrate those that have come before us, allowing for their legacies to live on. We look forward to seeing Harvey 'flying' into airports across the globe and continuing to spread his message of acceptance." Harvey Milk joins the rank of recently spotlighted American tail fin heroes including Mark Twain, Charles Lindbergh, Arthur Collins, Babe Ruth, Clara Barton, Sojourner Truth and Benjamin Franklin. The Harvey Milk aircraft is more than a flying tribute – it is fitted with custom art that depicts the brave life Harvey led so that customers on board will not only see his name but truly understand and connect to his life’s work. Europe’s third largest low-cost carrier flew 5.8 million passengers from the UK to over 50 global destinations in 2018. 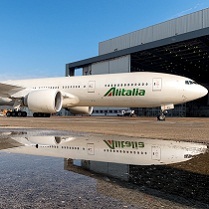 The airline has one of the youngest aircraft fleets in the world with an average age of 3.8 years, with more than 150 new aircraft on order. Norwegian has been named ‘World’s Best Low-Cost Long-Haul Airline’ for the fourth consecutive year and ‘Best Low-Cost Airline in Europe’ for the sixth year in a row at the renowned Skytrax World Airline Awards.